Mil - meeting with raam janaa; janaa means humble servants of raam, of Waheguru. Meeting with the humble Sikhs of Waheguru, meeting with the gursikhs of Waheguru, who meditate upon The Guru, who meditate upon Waheguru, meeting with those people who are inwardly and outwardly in tune with The Guru's Words, who are walking in The Guru's path. Raam janaa - who are the servants of God, inwardly and outwardly. Bhaeiaa - literally means to go into, to be in. To be in what? Ana(n)dhaa, to be in a state of ecstasy which is beyond words. Many times in the katha, we have talked about the word ana(n)dh. Anan meaning without, dh meaning duality, doubts, dubidha. To completely be imbued with that love. Ana(n)dh isn't talking about a pleasure which lasts for an hour or two hours or a few minutes or whatever. Its talking about eternal joy, eternal peace and poise inside, that is ana(n)dhaa. If you want to get that state of awareness, Guru Ram Das Jee is telling us on this day, O gursikhs, O followers of The Guru, O people of the world, meet with raam janaa, with the servants of The Guru. Meet with those people who meditate upon The Guru. What happens when you meet with them, when you sit with them? Har neekee kathhaa sunaae. They sunaae, they tell me about, I hear from them, neekee - the beautiful, glorious kathhaa - sermons, kathhaa - explanations, kathhaa - descriptions, kathhaa - stories, kathhaa - the wisdom, kathhaa - the spiritual knowledge of Hari, of Waheguru. I hear about the path to God. In gurbani we hear again and again, Guru Granth Sahib Jee tells us mai dhasihu maarag sa(n)theho kio prabhoo milaaeeaa ||O sa(n)theho, O saints, tell me the path to milaaeeaa, to meet with God. Guru Sahib is saying that if you meet with those who are blessed by The Guru, and you sit with them and you listen to the kathhaa, the path of The Guru, the explanation of the wisdom of The Guru, the description of The Guru's wisdom, then you will receive that aana(n)dh, that never-ending joy. Sab - all of the mail, the filth of what? Dhuramath. Sampardhaayaks have translated this to mean dhur math, that math, that wisdom which takes you dhoor, away from God. So, that intellect or those thoughts that or that path, that collective way of thinking which takes you dhoor, away from Waheguru, away from God, away from righteousness, away from the truth. Guru Sahib says, sitting with the saintly beings, listening to the kathhaa, the explanation of The Guru's path, listening to The Guru's Words, listening to stories of The Guru, the mail, the filth inside me of this dhuramath, of this intellect, of these thoughts that were breaking me away from The Lord; sab - all of them neekal - have been removed, have been completely destroyed. Mil - meeting with the sathasa(n)gath, the true company, the true congregation, or we can flip this around the other side; the congregation devoted to the truth, that sa(n)gath who is looking for the truth, looking for the eternal Waheguru, who sit together and are meditating upon The Guru's Words, upon The Guru's Bani. Mil - meeting with them I have paae, I have found the true budhh, the true understanding. So, all of these thoughts which were taking me away from Waheguru from Waheguru inside they have been removed, and instead instilled deep inside my heart is this budhh, this true understanding, this spiritual understanding. What do the raam jan, the servants of God do? Guramath, they take the teachings of The Guru upon them. What does The Guru say? The Guru says meditate upon The Naam and encourage others around you to meditate upon The Naam. We can read the words of Sri Guru Ram Das Jee Maharaj in Sri Guru Granth Sahib Jee Maharaj where Guru Sahib explains in Gauri Raag on Ang 306 of Guru Granth Sahib Jee what a Sikh is meant to do everyday. We've heard the shabad many times. gur sathigur kaa jo sikh akhaaeae s bhalakae out(h) har naam dhhiaavai ||. That person who calls himself a Sikh of The Guru must rise up in the early morning, in the early hours what we call the amritvela, the time of immortality and dhyaavai - meditate upon Hari, meditate upon God's Name. The very last line, the very last tukk of that shabad is - jan naanak dhhoorr ma(n)gai this gurasikh kee. Sri Guru Ram Das Jee says that even I am begging for the dust of the feet of that gursikh, of that follower of The Guru, jo aap japai - who him/herself meditates upon The Name of The Guru, avareh naam japaavai - and gets others to meditate. Raam jan guramath - they take the teaching os The Guru onboard which is to meditate yourself and encourage others - raam bolaae. Bolaae in this case means to encourage others. Various scholars such as Giani Harbans Singh, Professor Sahib Singh have translated this as encouraging, getting others to speak, getting others to meditate upon raam, upon Waheguru. Whoever truly listens. Jo jo, there are two jos here, what does that mean? That means with both ears. It means deeper than that, it means to listen with your mind. Jo jo sunai, those people who listen completely, inwardly and outwardly are focussed. Kehai - those people who speak the words of God's Name, those people who chant The Guru's Bani, who chant The Guru's mantar, The Waheguru mantar with their tongues, so mukathaa - they will be liberated. What will they be liberated from? They'll be liberated from their ego, from their desires, from their greed, from their anger, from their hatred, from their attachment. Those people who truly listen, who speak and chant The Name of Waheguru with their tongue and listen with their ears; raam japath sohaae. Those people who japath, who meditate upon The Naam, sohaae - they are beautiful. What does that mean? That means their eyes are filled with the beauty of God's love. Their tongue is sweet with The Guru's words. Rehaao - pause and think about this today Guru Ram Das Jee says. Those people, who upon their mukh, upon their faces and their masathak, their foreheads have vadd bhaag. Vadd bhaag means blessed fortunes, blessed destinies written upon their foreheads; har raam janaa bhaettaae. They bhaettaae, they meet with, they go into the company of raam janaa, of servants of God. O God, bless me with Your Grace, with Your kirapaa and give me the dharasan, give me the blessed vision of the sa(n)th, of the saints. What happens when you meet with the saints? sabh dhaaladh dhukh lehi jaae. If you sit with the saints and listen to the kathhaa, the teachings of The Guru, if you sit with the saints and you chant The Name of God, you listen to it internally and externally; sab - all of your dhaaladh, all of your poverty, dhukh - pain, lehi jaae - will be removed. Gurmukh piaareyo, what is the poverty we have inside us? We have the poverty of a lack of compassion, a lack of love, a lack of peace inside. There may be lots of money in our pockets, but no peace in our hearts. That's the true poverty. All of that poverty, all of those pains built up from many lifetimes will be removed. The jan, the servants of Hari, of Raam, of Waheguru are neekae, are blessed. They are God's people. However, those who are bhaageheen, those who are unfortunate, n sukhaae. They do not like them. They aren't pleased when they see them. There are a few interpretations of this. Jio jio - as, jan oochae - those spiritually high servants of The Lord, kehehi - meditate upon God. That's one interpretation of the first part of this tukk. 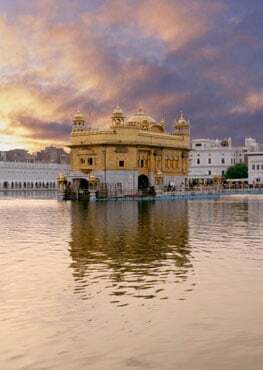 Second, as the jan, as the humble servants oochae - loudly, kehehi - chant The Name of Hari, of Waheguru, of God. The third interpretation is - as they meditate upon Waheguru, as they continually keep meditating, jan oochae - they get higher and higher, into a higher and higher spiritual state. Gurmukh piaareyo, in all these interpretations, we can take the second part of the tukk in one interpretation. Nar ni(n)dhak dda(n)s lagaae. Seeing these people meditating upon Waheguru, those nar, those human beings who are ni(n)dhak, who just live to slander dda(n)s lagaae. When they hear the jan meditating upon Waheguru, reading The Guru's Bani, when they hear them chanting The Guru's Words, it is as if they are dda(n)s, they're being stung. It's like they're being bitten. There are some people upon this earth, who when they see others meditating, it hurts them. It hurts them like the bite of a cobra, like the sting of a scorpion. Why? Because gurmukh piaareyo, there's something about us, about the anger, the krodh inside where when we see someone else going into a peaceful state, we can't take it. Sathiguru Ram Das Jee Maharaj is talking about that lowly state of mind. Those people who are not pleased, who do not love the jan, the servants of God, their lives pass away like a curse - dhhrig dhhrig. Everything they do is full of that hatred and that anger. Har kae sakhaa sakhaae - Because those jan, those servants are the sakhaa sakhaae. They are the friends of Waheguru. they have befriended the true friend of their soul. jaa kaa meeth saajan hai sameeaa || this jan ko kahu kaa kee kameeaa ||1||. That person who has befriended God, what else does that person need? O har jeeo, O blessed Waheguru, O great God, O dear Lord. Raakhahu - please save me with Your dhaeiaa. Dhaeiaa dhaeiaa kar, please bless me with Your mercy, bless me with Your mercy, save me, raakhahu, protect me Waheguru! ham dheen, I am lowly. Thaeree saranaae - but I have come into Your protection. ham baarik, I am Your child. O Lord God, thum pithaa, You are my father, prabh maerae O my Lord God. Jan naanak bakhas milaae - please bakhas please forgive me milaae, unite me. Unite me with Your sangat, unite me with The Guru, unite me with You O Waheguru. Guru Sahib Jee is telling us if you want to enter into the protection of God, you have to become like a child. Like a child you have to give up all your deceit and corruption. Like a child you have to be totally dependent. Just like a child is totally dependent upon their parents. It doesn't look to anyone else. If a child wants to buy an ice cream, it doesn't run into the street to ask someone or anyone else. It runs to it's mother. In the same way, O Sikh of The Guru, if you want to run into the protection of The Guru, love The Guru like a mother and a father. Love The Guru as a child.